Bonding with horses is a rewarding experience — in some ways better than bonding with humans. People have opinions, and rarely do they keep them to themselves these days. But equine are too smart for that. They have enough horse sense to steer clear of politics — and other relationship killers. And so it was that a dapple brown horse and I came to be friends at the Tanque Verde Ranch near Tucson, recently. Scatter Gun wasn’t the only horse in the herd, but he certainly caught my eye. Yet the first day I rode him, he seemed distant and aloof. I took each snort to mean when will this irritating woman get off my back? He showed me how to work with my charge, to establish myself as dominant, and to gain the animal’s trust. Within minutes, my horse stood adoringly by my side, accepting me as its leader and its friend. “Horses want security more than anything else,” Chambers shared. But unlike other animals of prey, horses will give humans their trust. A survey of travelers finds most want an emotional tie to their destination these days. They want to come away feeling they’ve made a connection and learned something valuable. It’s not just about relaxing, but about growing — which brings me back to the Tanque Verde Ranch.With the economic downturn, even the best family destinations can seem quiet. That means amenities like riding lessons (all inclusive at this dude ranch resort) are practically private. With fewer people traveling now, you can have peaceful walks in the desert, surrounded by blooming cactus and snow-capped mountains in spring. 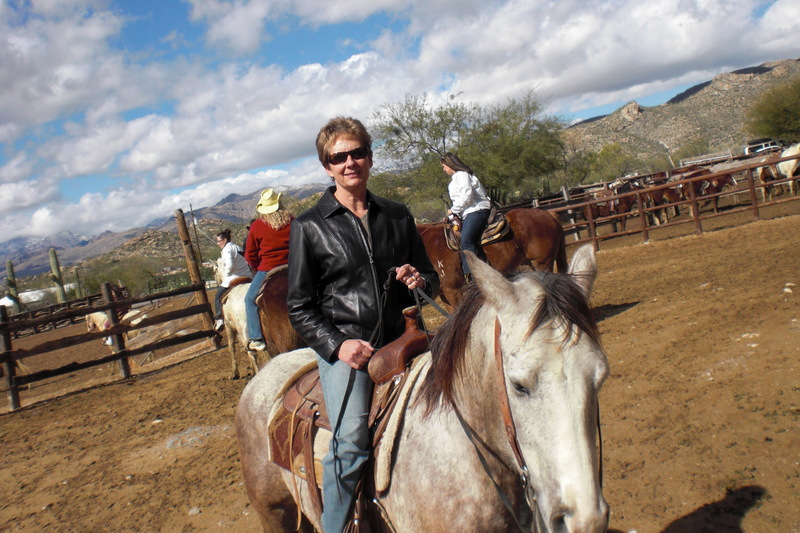 A typical day at Tanque Verde Ranch may see you taking a morning trail ride, high in the hills overlooking Paul McCartney’s sprawling desert mansion. Your afternoon activities may include tennis, mountain biking, or a riding lesson. Or, you might choose a nature walk or birding — or a massage”… or a nap.